Fabricators and installers can now offer house builders and developers a high aesthetic, high performance and easily-fitted in-line PVC-U patio door system that, when specified to PAS24 standards, automatically meets Approved Document Q of the Building Regulations. The Eurocell Euroslide system has been developed specially to meet the challenges of the amended Part Q; and it is believed to be the first patio door to conform this stringent security standard as well as Lifetime Homes Standard specifications, where applicable. The regulatory change, effective since October 2015, sets out what it describes as ‘reasonable standards’ for doors and windows in new dwellings to resist physical attack by a casual or opportunist burglar, by being both sufficiently robust and fitted with appropriate hardware. Euroslide is an easily fitted in-line PVC-U patio door that is suitable for any development subject to Building Control such as new build and large extensions. Euroslide can also be retro-fitted so that homeowners can enjoy the benefits of patio doors while reducing the risks of becoming burglary victims. Euroslide incorporates a fully-fabricated aluminium interlock with a three-point locking mechanism that has three pairs of 304-grade stainless steel interlock protectors and is operated by a small ergonomically-designed lever located just 900mm above the floor. The height of the lever is an important feature, enabling it to be used easily by everyone including wheelchair users –– which means that the door meets the guidelines set out in Lifetime Homes, where still required; and also meets the trend towards increasingly ‘multi-generational’ dwellings. An added advantage to this versatile system is that it can be installed with Eurocell’s low threshold to comply fully with Part M access requirements – also overhauled in October 2015 after the Government’s Housing Standards Review. Other features that make a PAS24-specification Euroslide patio door such an effective barrier to intruders include a heavy-duty door sash reinforcement to protect against forced entry and high winds and an anti-lift fixture that stops intruders lifting panes out of the door frame – a common weak spot in traditional door and window design. The design ensures that intruders cannot reach any of the gaskets and sealants to gain entry because they are applied from the inside. As with any Eurocell PVC-U product, Euroslide has an exact colour-match guarantee, so that the colour is precisely matched to all Eurocell window, door and conservatory roof products, creating a co-ordinated, consistent look across any property. Euroslide is normally manufactured with a white internal finish to maintain a bright, fresh interior, but some colours are available on both sides from stock. White, golden oak, anthracite grey, rosewood, and black ash are supplied with a white interior finish while cream, rosewood, golden oak and Irish oak are available with matching finishes externally and internally. 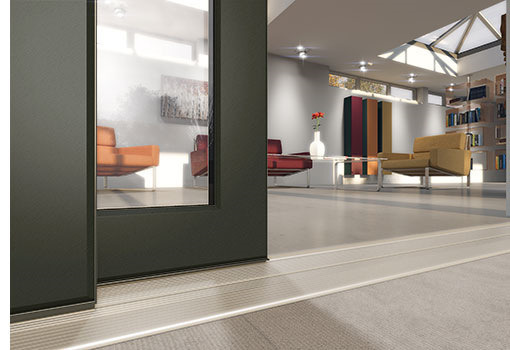 For more details on the high-performance Euroslide PVC-U patio door system, visit eurocell.co.uk/euroslide or contact the customer care team directly on 0800 988 3047.